Home » Egypt » Can Gulf Money Save Egypt’s Economy? Can Gulf Money Save Egypt’s Economy? In recent months, Egypt has received nearly $20 billion in loans and grants from its Gulf allies. But the price of political stability is a lot higher. 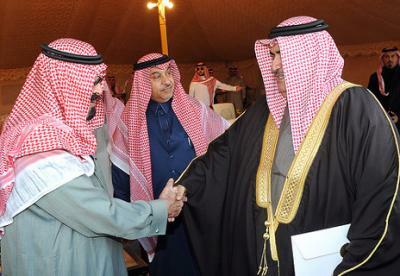 King Abdullah of Saudi Arabia (left) meets Bahrain’s foreign minister. Photograph by Bahrain Foreign Ministry. At the end of August, Egypt’s military-backed interim government – established in the wake of former president Mohamed Morsi’s overthrow – approved an infrastructure spending package worth $3.2 billion. Following months of political unrest and mass protests, the package – to be rolled out over the next ten months – is aimed at boosting an economy struggling against the effects of widespread unemployment and rising food and fuel prices. These were problems which went largely unaddressed by the Muslim Brotherhood administration and which had contributed to Morsi’s plummeting popularity before he was deposed at the start of July. Most analysts have now welcomed the infrastructural investment as an essential first step on the road to economic recovery. But concerns have also been raised about how exactly the government will pay for it. Although Egypt’s budget deficit now stands at more than 10% of GDP, government officials have ruled out tax rises or public spending cuts as possible ways of balancing the books. Meanwhile, over the summer, negotiations between the Egyptian government and the International Monetary Fund (IMF) were abandoned when the Egyptian government rejected the IMF’s loan conditions, which included ending the bread and petrol subsidies many Egyptians depend on. As a result, Egypt has become increasingly reliant on loans and grants from friendly Arab states. In recent months, Egypt has received a $2 billion interest-free loan from Libya as well as nearly $5 billion in Qatari aid. Not long after the overthrow of Morsi, a further $12 billion in loans, grants and fuel shipments was pledged by Saudi Arabia, Kuwait and the United Arab Emirates (UAE), of which $5 billion has already been delivered. It is this money that will fund the additional expenditure on new railways, roads, sewage treatment plants and an extension to the Cairo metro, among other big ticket items, but the loans also have broader implications. Saudi Arabia’s decision to channel funds to Egypt is significant. Riyadh is keen to limit the influence of the Muslim Brotherhood – a group the Saudis view as a threat to their status as the regional ‘protector of Islam’ across the Middle East – and the Saudi monarch, King Abdullah, gave his full backing to Morsi’s toppling. The Saudi regime may therefore have been pleased that the reassertion of military control in Egypt this summer was followed by a swift crackdown on the Muslim Brotherhood. The first and second tier of the Brotherhood’s leadership was arrested, while its assets were frozen and affiliate organisations banned. Morsi himself is currently in custody awaiting trial. The funds sent to Egypt also further bind the Egyptian economy to Saudi Arabia, where as many as 2 million Egyptians currently reside as guest workers and whose remittances are an important source of income for many Egyptian families. Moreover, the increasing closeness of the Egyptian authorities to Saudi Arabia signals a loosening of Egypt’s ties to the United States and Turkey, both of which have given substantial amounts of aid to Egypt in the past, but often in return for structural economic reforms – not least to the subsidy system – opposed by the Egyptian people. By contrast, the financial support provided by Saudi Arabia, Kuwait and the UAE (and even Libya) is not conditional on the government reigning in public spending or selling-off public assets. Shifting away from the West and towards the Gulf will temporarily liberate the government from having to make the sorts of difficult economic decisions which could ignite further social unrest. This will buy it some time as it ponders its next move. What that next move will be remains to be seen. The interim president, Adly Mansour, has said he will stick to the pre-existing electoral timetable, which means another round of presidential and parliamentary elections should be held early next year. However Mansour has not kept all his promises. Despite an earlier pledge, for example, the country remains under a state of emergency. Meanwhile, although the political unrest that followed Morsi’s overthrow has died down to an extent, poverty continues to rise as it has done in recent years, and nearly a fifth of the population is now suffering from food insecurity. Egypt’s interim government will hope its Gulf stimulus package will be sufficient to take the economy back to its pre-revolution growth levels (5% in 2010, as opposed to the current 2%). It will need extra revenue to pay off some of its debts. But it would also do well to remember that the revolution which toppled Hosni Mubarak in 2011 was inspired as much by growing levels of poverty and inequality as it was by widespread frustration at Mubarak’s authoritarian rule. Money from the Gulf may represent a convenient short-term alternative to the West’s liberalising influence, but it will not be enough to secure Egypt’s long-term political stability.